Call 971-544-0381 or email EuroEscapes for Current Specials. This recently renovated and spacious vessel offers a wonderful itinerary along the southern Burgundy canal, passing through rolling hills and charming towns. You will enjoy an experience of a lifetime. A tour of Dijon is a highlight of this cruise, along with wine tasting and a tour of Beaune, wine capital of Burgundy. Highlights also include: A visit to the Hilltop Chateauneuf–en-Auxois, town and castle. A visit of the Abbaye de la Bussiere with opportunities for walking or cycling along the towpaths. Optional hot air ballooning (weather permitting) This fine all-suite hotel boat provides exceptional standards of comfort and is wheelchair accessible. The upper deck is air-conditioned and the lower deck boasts 4 suites, all with portholes and bathrooms with shower or bath and private toilet. The upper deck features an elegant dining-room and a luxuriously furnished lounge with a bar. This newly remodeled hotel boat can hold up to 8 passengers. Arrival at Chateau la Chassagne, Pont de Pany, near Dijon. At 5 pm your crew will meet you at a designated spot and drive you directly to the barge, La Reine Pedauque, in an air-conditioned Minibus. You are welcomed on board with a “Kir Royal” by the crew. An unforgettable cruise is about to begin in Burgundy. Your first exceptional candle light dinner will mark your introduction to regional specialties and wines with great names. The bar and sun deck provide a warm atmosphere to share drinks with fellow passengers. Naturally, all drinks served on board are “all inclusive” and available around the clock. Cruise from Vandenesse to Pont d’ Ouche The Captain has a hard day’s work ahead, with many locks between Vandenesse and the destination of Pont d’Ouche, the navigation is very interesting. A wonderful occasion for you to enjoy the countryside as the barge glides along the canal. While you have a hearty breakfast, La Reine Pedauque leaves the port of Vandenesse and begins to pass through the first locks (there is a total of 45 locks during the weeks cruise). Arriving in the village of Crugey at midday, the chef will enchant you with a typical Burgundy menu. After the lunch time break the barge continues the voyage to the tempo of the canal locks to Pont d’Ouche. When your hotel barge is moored, you will be invited to visit Chateauneuf en Auxois which you passed by today. Walk into this medieval village with its cafes, antique and curiosity shops along the picturesque streets. There is also a fantastic view over the Auxois plains, with lakes and the distant Morvan hills. Pont d’ Ouche to Gissey sur Ouche Today the barge cruise will take you into the magnificent Valley of the Ouche, a journey back in time passing through a unique landscape as the canal twists through the narrow valley. You will have many occasions to be sportive with walking and cycling along the tow-path. La Reine Pedauque will pass through the villages of La Buissière sur Ouche, Saint Victor to Gissey sur Ouche. There the barge is moored in a hidden romantic spot, beside the river Ouche and a Gallo Roman bridge, one of the most photographed and painted views. Today the passengers will be taken to a wine degustation in the wine cellar at Château la Chassagne. After diner there will be a great farewell party on board for the passengers who only booked the Mini-Cruise. Passengers and crew will have a lot of fun. Gissey sur Ouche Grande excursion to Beaune for the 7 day cruise passengers Check out / check in 4-days / 3-nights Mini cruise passengers Today you will make an excursion to the capital of Burgundy wines, the town of Beaune. You’ll be in some of the finest vine yards of France, such as Aloxe Corton, wine tasting some of the greatest Crus, with expert advice from wine Connoisseurs. Lunch is offered in an traditional restaurant, with the vines in the background and dishes to delight your palette. In the afternoon, there is plenty of time to visit the famous Hospices de Beaune built in 1443 and stroll along cobbled streets with boutiques of all kinds. The return to the barge takes you through the “Hautes Côtes” vine yards and past the source of the river Ouche. The chef has prepared a special diner for you and to welcome the new passengers who have booked the Mini Cruise on the second part of your journey. Gissey sur Ouche to Fleurey sur Ouche As the valley slowly unfolds, the barge passes through the charming villages of Saint Marie sur Ouche and Pont de Pany, with Chateau la Chassagneon the hill side. The barge heads on to the village of Fleurey sur Ouche. There are many opportunities to use the mountain bikes and explore the surroundings or a short walk to a nearby café. Once moored in Fleurey sur Ouche there are possibilities to discover more about the region, from Gallo-Roman ruins to feudal castles with dramatic histories. Today the passengers tell the guide where they would like to go: For example la Route des Grand Crus, Clos Vougeot or Nuit Saint Georges.. On returning to the barge, your diner will delight you with carefully prepared dishes and selected wines. Like every other day, typically French so “Bon Appetite”. 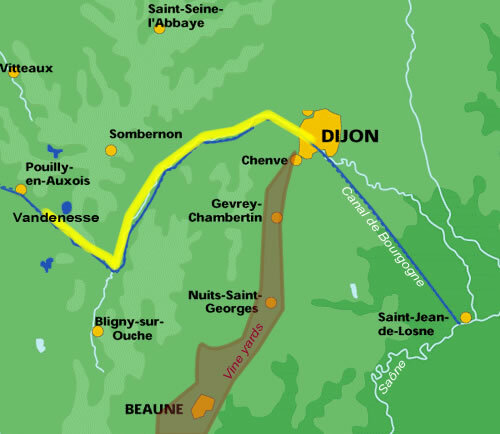 On today’s journey the barge will follow the route via Plombières les Dijon. La Reine Pedauque passes beside the “Lac Kir”, built for Canon Kir, once mayor of Dijon, after whom the famous aperitif was named. The barge finally arrives in the splendid port of Dijon, near the heart of the city. The ancient palace to the powerful Dukes of Burgundy, Notre Dame, Rue de la Chouette are just some of the splendours of Dijon, the city of a hundred bells. As Dijon is the world’s capital of mustard, an assortment of local mustards is offered to you as souvenir. For tonight’s cocktails on board you can learn the art of “Sabrage”, where you can slash open a Champagne bottle with a sword, like the Dukes of Burgundy did hundreds of years ago. Then everybody will be in the right mood for the grand farewell diner and the remittance of your “Lock Diploma”. After a generous breakfast, passengers will generally disembark at about 10:30 am. Depending on your personal plans we will take you back to Chateau la Chassagne, the railway station or even the airport at Dijon. As this is a one-way cruise, the itinerary is also operated in the opposite direction according to starting date. We reserve the right to alter the leisure program and it may be changed due to unpredictable circumstances.